Studebaker was one of the great early pioneers of the automotive industry in America and at one time held their own against the likes of Ford and Chrysler. However as time moved on, especially after WW2, Studebaker started to struggle and the companies small size, plus other market pressures made it harder for it to compete against “the big three”. Despite the financial pressures it was under, Studebaker continued to produce some impressive cars and this lead to an increased focus on performance. And the Studebaker Gran Turismo Hawk was one that set the tone for the companies final years. 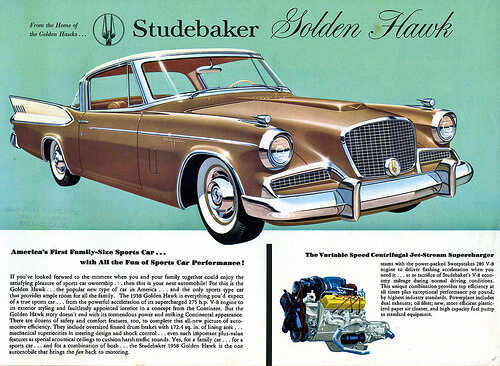 The Studebaker Golden Hawk offered family comfort with a sporty performance. Based on the original Golden Hawk from 1956, the new GT Hawk was a two door sports coupe that combined European styling with American V8 performance. In standard 289 guise it was no muscle car but was instead a relaxed cruiser with plenty of torque and a tasty exhaust note. The two door coupe really got its performance stripes in 1963 when the Avanti supercharged R-Series V8 was introduced. With around 240BHP on tap, the R-Series Hawks packed a serious punch and while the car weighed more than its rivals, it still was a serious performance contender. Unfortunately the R-Series upgrades weren’t enough to save the Hawk coupe range and in 1963, Studebaker closed its South Bend Indiana plant, bringing Hawk production to an end. The revised Gran Turismo Hawk was sleeker and featured smaller fins and less chrome detailing. Every so often you meet someone who is committed to a particular marque. And Greg Diffen is one such enthusiast who has been a fan of Studebakers since he was a kid. It’s not always possible to carry through that connection with a marque from such a young age. Sometimes circumstance and faith don’t allow it. But with Greg I got the feeling that when his Dad bought home the first family Studebaker Hawk back in Australia, he became a fan the moment he sat in it. We all know that childhood memories are important and can grow more powerful as we get older. 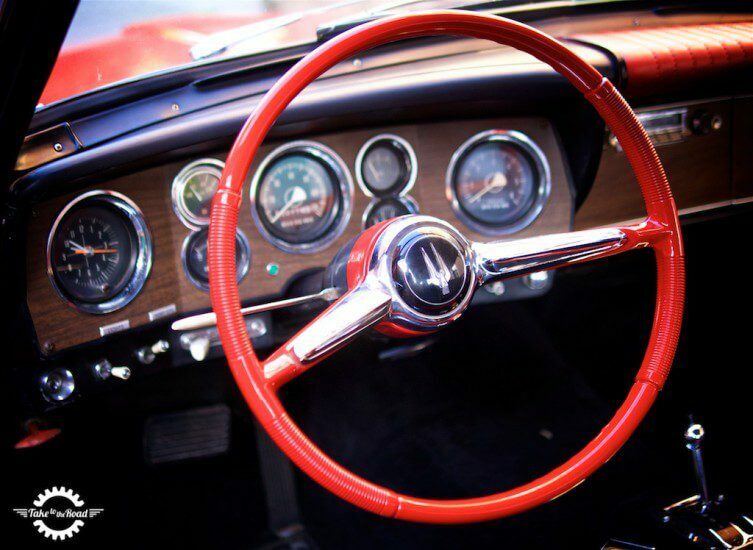 And having that physical connection with a moment or time in the past only increases the sense of nostalgia, especially when its linked to an old car. And it is that passion that is so fascinating. So to say that Greg has a couple of Studebaker’s is an understatement. He has just a few. 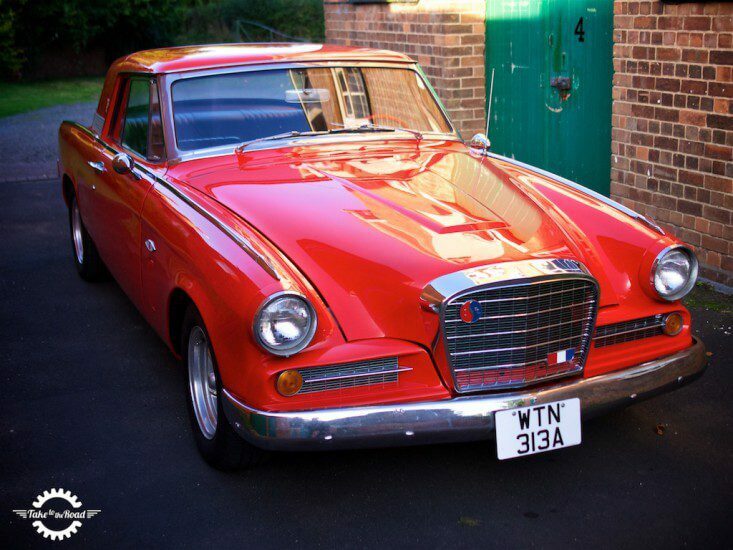 Enough to say “you quite like Studebaker’s don’t you?”. Which isn’t really a question… its more a statement. Some of us are more than happy with one classic car in the garage. And some of us would also be very happy with a shed (or two) full of classics. For Greg it is his passion for a wide range of pre war and post war Studebaker’s that has lead him to build up an impressive collection. Two of which I got the chance to film. The GT Hawk was a design refresh of the Golden Hawk. 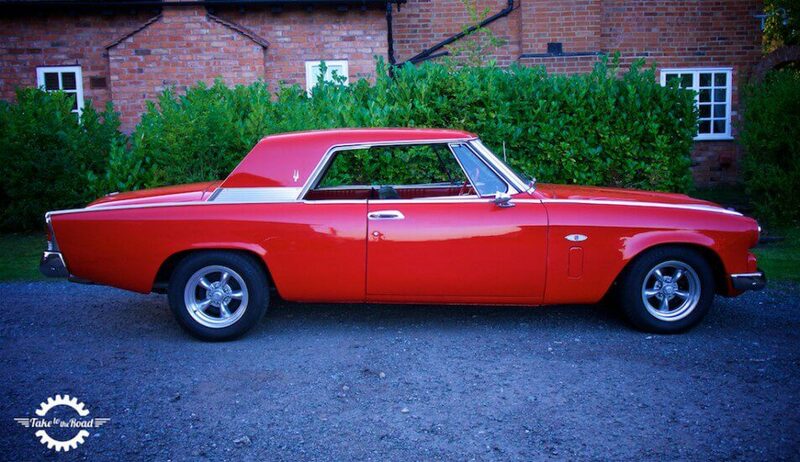 For me the Studebaker GT Hawk ticks a lot of boxes. First of all its a two door pillarless coupe. It has a 289 V8 which is always good. And while it is an American cruiser, there is enough of a hint of 1950s Mercedes in the design to give it a European look. All those details combine to make a car thats different from anything else. And that is what I like about Greg’s two Studebaker GT Hawks. The Hawk utilised an older chassis design to save costs. But it didn’t compromise performance. The 1964 white Studebaker GT Hawk is a stylish two door coupe. It has nice curves and subtle rear fins to give it an aerodynamic appearance. The large front grill and twin headlamps are very distinctive and it is there that the Mercedes influence can be seen. One thing that really impressed me actually was the floorpan design of the GT Hawk. 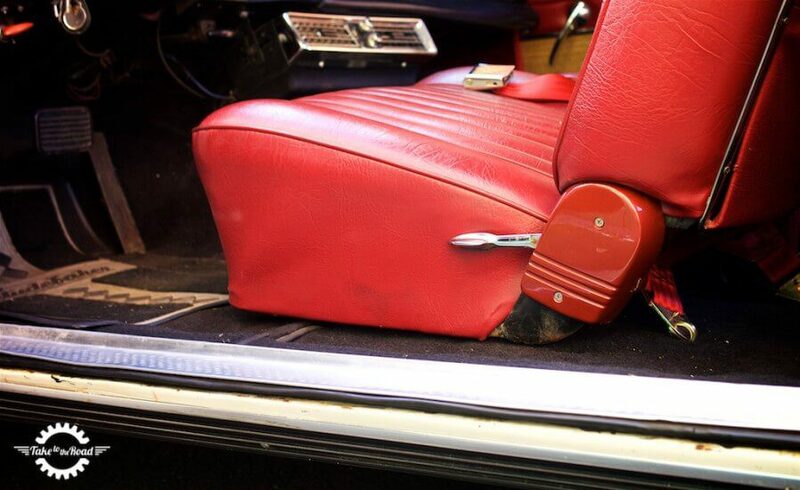 As cars have developed over time we’ve gotten used to stepping in over large side sills and down into the seat/footwell. With the Hawk, the floor is almost flat at the side which makes it very easy to swing in and out of the car. It’s an easy detail to miss but one I liked. To me it added to the comfortable cruiser image. The comfy vinyl seats a nice touch to the interior. 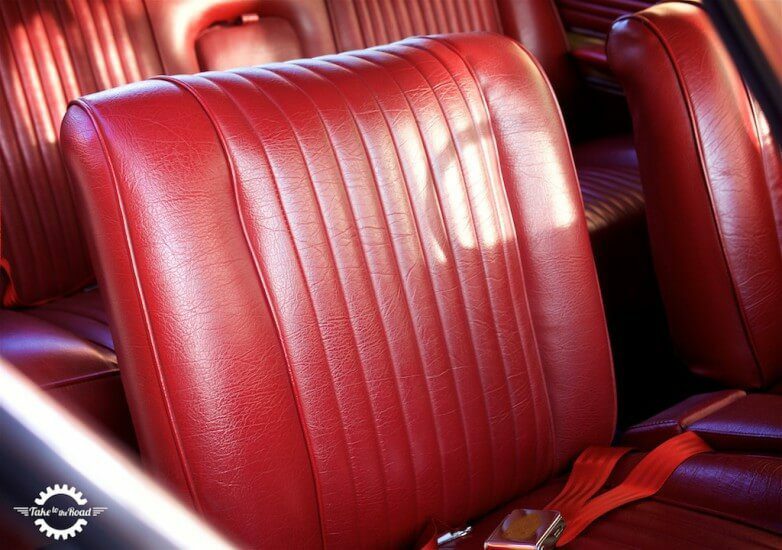 Inside the interior is spacious and the vinyl seats nice and comfortable. The dashboard is nicely laid out and is not over done with chrome. We all know American’s like their chromed interiors. So it was quite refreshing to see the Hawk dash done tastefully. And as this is an American two door coupe, there was plenty of room in the back, making it a practical car. The low side sill makes it nice and easy to get in and out of the car. Firing up the 289 motor unleashed the wonderful noise of a very sweet V8. It really does sound gorgeous, the kind I would never grow tired of hearing. While you could say it sounds like most American V8s of the period, there is a distinctive rumble to the Studebaker 289 and it really suits the car. As Greg pulled away the gearbox changed smoothly. It didn’t feel particularly quick but that is down to the cars style. It’s an all round American cruiser so it is very happy just burbling along at low speeds. And when you need it, the kick down on the auto is there. It’s not the fastest V8 around but as a combined package it is just right. 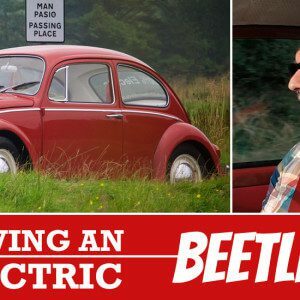 The seats are comfortable, there’s plenty of cabin space, its got an automatic transmission and a big torquey motor up front. Added to that are power steering, power disc brakes (on the front) and air conditioning. There’s a lot to like here. 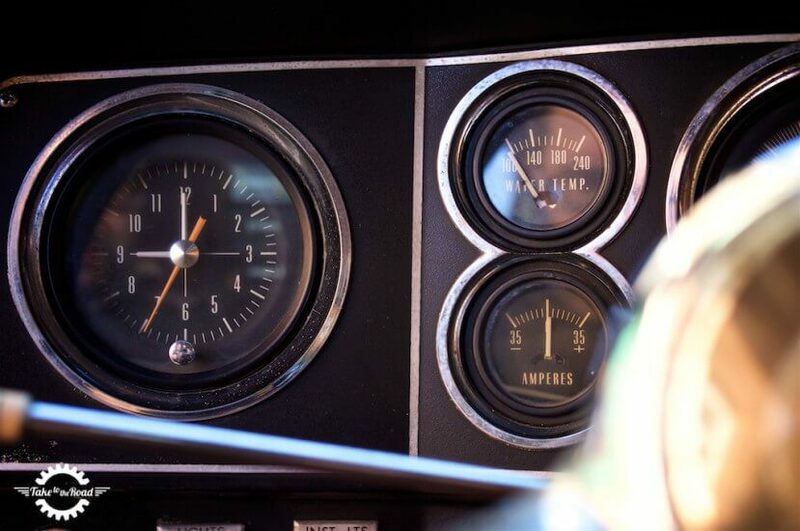 The black dash and chrome dials are nice and understated. When Greg brought out the red 1963 Studebaker GT Hawk I knew I was in for a treat. Straight away when the car fired up it sounded angry. The whole body shaked as the V8 rumbled into life. I knew straight away this one was a bit special. This GT Hawk is basically an Avanti R2 clone. It sure looks the part! Pulling away in the red Hawk was just a bit different to the white Hawk. It was fast. Very fast! It felt like a caged bull trying to escape. No wonder he said it was an animal. Despite it being essentially the same car, this Hawk was a world apart from the other. 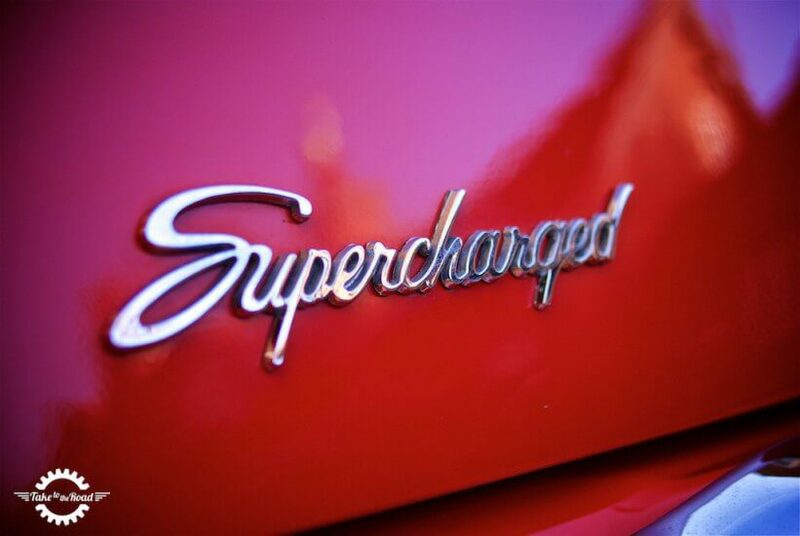 And that was down to the Avanti supercharger and the R3 pressure box upgrades. Greg isn’t quite sure how much this engine is putting out (he hasn’t had it on a rolling road) but he reckons it’s around the 300BHP mark. Or more. It sure felt like a 300BHP V8! The business end with all the upgrades! It really is the kind of car that makes you want to put the boot down and burn rubber. 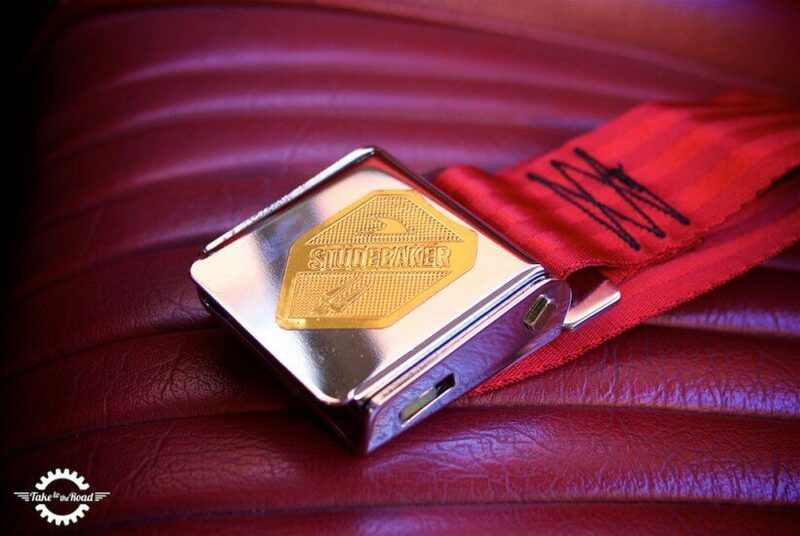 The whistle from the supercharger is addictive and combined with the V8, it is one of the greatest sounds to come out of a car. And all of this happens whilst having a massive grin on your face. The pillarless look is “killer”… as they often say on car tv shows. We love it! Thanks to some tweaks to the suspension (it has a heavy duty sway bar at the back), it actually handles pretty well for a heavy American coupe. Though as you saw in the film, it liked to squeal the rear tyres a little… which just adds to the fun. And that is what this car is. It is a fun Studebaker GT Hawk. 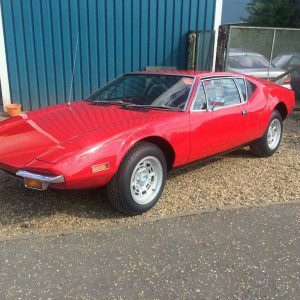 Yes its not a genuine R2/R3 Avanti coupe but you don’t really care. This is a V8 for the driver who likes to live a little. It guarantees to get the blood flowing every time you take it out. The lighter wood finish on the dash is a nice contrast to the other Hawk. So has Greg converted me to the Studebaker GT Hawk? Yes 100%! They have always been on my radar to be honest and it was great to finally spend some time with these unique American sports coupes. If I had to choose one I’d probably go for the Avanti R2… but then I like the appeal of the cruiser as well. It’s a tough one really. In an ideal world I’d probably have both of them if I was truthful. And that’s how collecting more than one model of the same marque begins. Yes its a disease that gets under the skin but we love it at the end of the day. 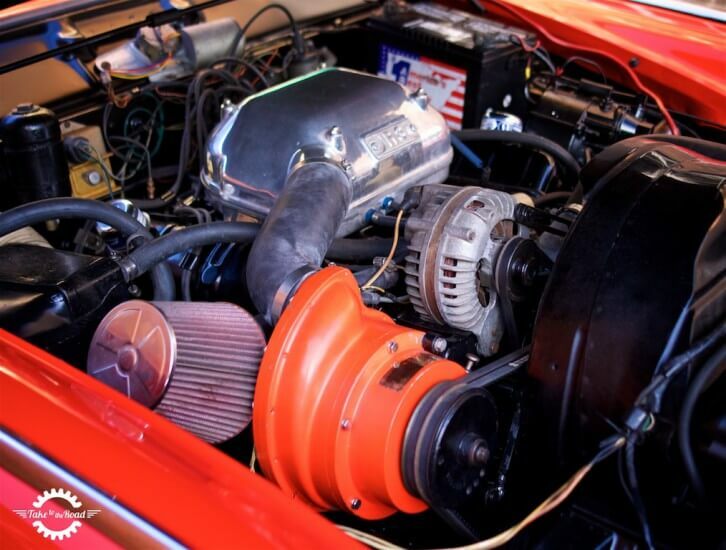 It’s all part and parcel of being a classic car fan, particularly a fan who wants to own more than one classic. Because ones just not enough… right? We wouldn’t have it any other way. I think Greg knows what I mean. 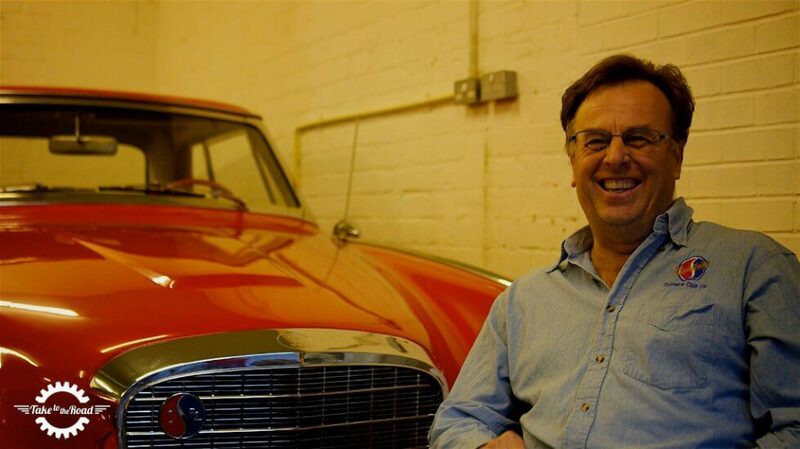 Greg is one of those enthusiasts who lives and breathes the Studebaker marque. This R2 clone is one fun car! Studebaker. A shame they are no longer around. After filming Greg told me he has decided to sell his GT Hawks to focus on getting his vintage Studebakers back on the road (both made a brief appearance in the film). Both Hawks are now going to auction in the next few months so you can get the chance to own a car that has stared on Take to the Road. Greg’s white Studebaker GT Hawk is up for sale after it didn’t attract a buyer at Classics Central’s sale. You can find more details on the eBay auction here. 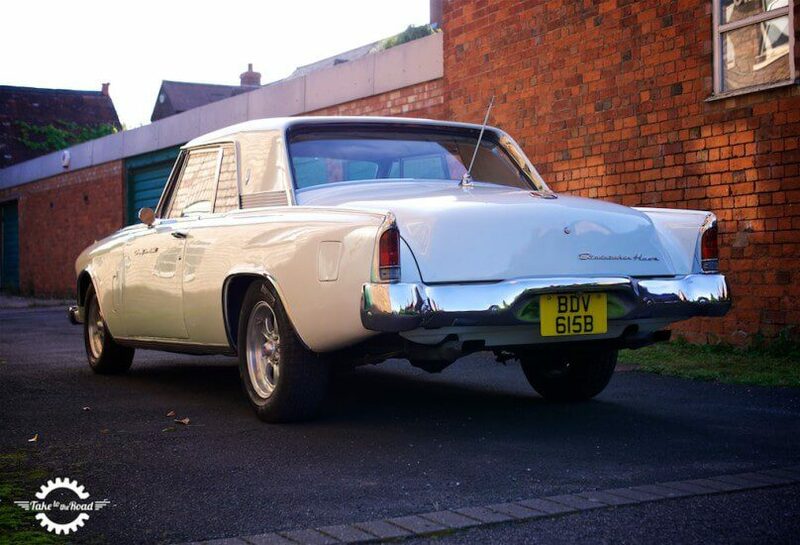 The white 1964 Studebaker GT Hawk is being offered at Classics Central Auctions on Sunday 30th October. It has a guide price of £12,000 – £14,000. More details can be found here on Classics Central’s website. 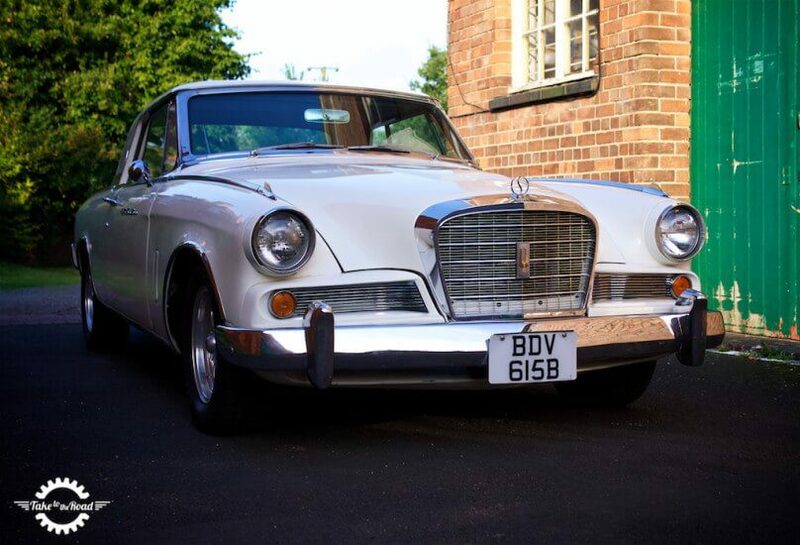 The 1963 Studebaker GT Hawk Avanti R2 is being offered at Historics at Brooklands Auctions on Saturday 26th November. It has a guide price of £15,000 – £19,000. More details can be found on Historics at Brooklands website. I would love to photograph those vintage cars in some events. Thanks! It is pretty cool getting the chance to photograph old cars. Its a great opportunity to get up close and spend some time with them.